What are the benefits of subscription? You will get automatic updates to your laptop or mobile. Notes will work in offline mode so that you get faster access. You can search inside your notes. Search is fast and accurate so that you get most relevant notes from our compilation. Are you the ONE who don't like to take chances and waste one precious year by failing in Prelims? Over 60 people were killed and many more injured in Amritsar, when a train mowed down a crowd of Dussehra revellers. NDMA had released an elaborate document for integrated crowd management. As per this document, the integrated crowd management is based on several pillars such as capacity planning, risk assessment, improved preparedness planning, incidence response, capacity building etc. Initial focus should be on traffic regulations around the mass gathering venues. There should be a route map for venues along with emergency exits route maps. Also, there should be Barricade facility to control the movement of crowd queues. In case of large crowd gathering, there should be snake line approach, along with constant monitoring of crowds for developing hazard points. VIPs : There should be specific plans to handle VIPs and if VIPs add the security concerns then authorities should refuse entry to VIPs. Communications : There should be CCTV surveillance, along with another public address system, such as loudspeakers should be installed at all crowded points, in order to communicate with the crowds. Medical facilities : Ambulance and health care professionals should be available on venues. NDMA has recommended the medical first-aid rooms and emergency operations in order to handle post-disaster emergencies. Basic facilities : The venue organisers should ensure authorised use of electricity, fire safety extinguishers and other arrangements as per the safety guidelines. Event organizers : Event organizers and venue managers should prepare and review the disaster management plan by coordinating with local administration and police. This will ensure that all the necessary facilities such as transport, medical and emergency facilities are as per safety standards. Civil society : Police authorities should access the preparedness. Also, Event/venue managers should involve NGOs and civil society in traffic control, medical assistance and mobilization of local resources in case of disaster. In order to be proactive, there is need to focus on the capacity building. Also, the training manual should be periodically in order to usher in new crowd management technique. Apart from that if there is issue of insufficient Security personnel, students, NGOs and civil society should be roped in. Also, the media should be trained to manage communications during crowd disasters. Prepare communities to deal with disasters in a manner that people’s lives and properties are protected, and to ultimately become resilient. Public awareness generation will serve to empower people with knowledge about the role and responsibilities of the state. Targeting schools, colleges and all educational institutions is a very important part of awareness. It has to be sustained through constant updating, upgrading and mock drills. Awareness will also help in induction of the constantly evolving knowledge of science and technology as well as research and development applications. To overcome the power cut it is important to have rooftop solar and battery storage systems as supplementary power sources for households and corporates. Planting trees with strong root systems and pruning the canopy ahead of cyclone season could reduce uprooting. The government should restore infrastructure and provide priority relief to the families of those who lost their lives, and the worst-hit communities. Efficient use of technology and implementation of the Sendai framework is the need to the hour. Collaboration with other countries in the region to strengthen the cooperation and efforts and to make a common fund for disaster management. Construction of multipurpose cyclone shelters, access roads, saline embankments and underground. By taking long and short term mitigation measures, the loss of life and property can be minimized. Under Disaster Management Act 2005, a financial mechanism has been set up by way of National Disaster Response Fund (NDRF) at national level and State Disaster Response Fund (SDRF) at state level to meet rescue and relief expenditure during any notified disaster. SDRF has been constituted in each State in which Centre, so far, had been contributing 75% for General Category States and 90% for Special Category States of hilly regions every year. Now, Central government will contribute 90% and all States will contribute 10% to the SDRF. SDRF is resource available to States to meet expenses of relief operations of immediate nature, for range of specified disasters. At any point, State Government has fair amount of funds available under SDRF. In case of any natural calamity beyond coping capacity of State, additional financial assistance is provided by Central Government from NDRF as per norms in which 100% funding is by Central Government. 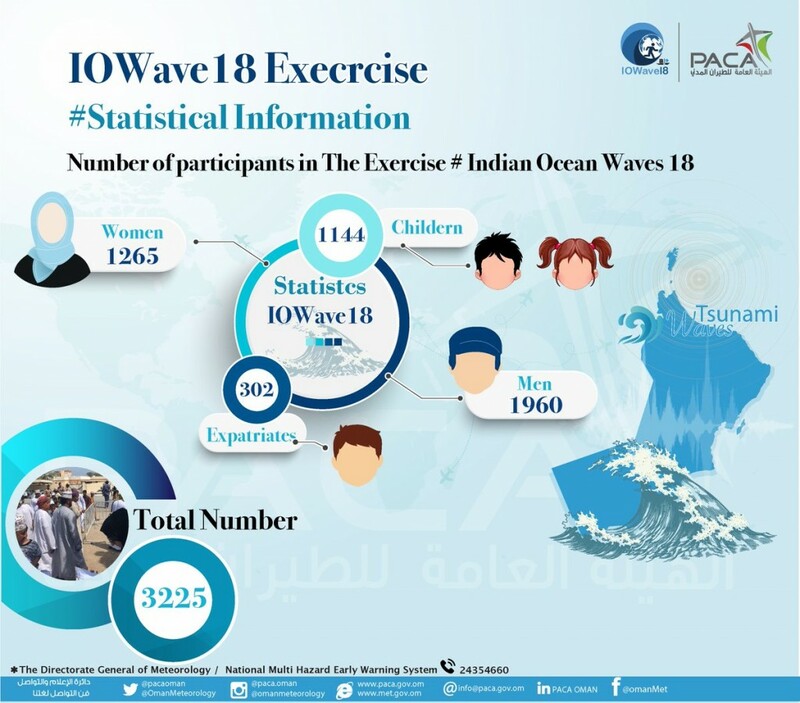 It is a major Indian ocean-wide tsunami mock exercise. The exercise is being organized by Intergovernmental Oceanographic Commission (IOC) of UNESCO. It will involve evacuation of thousands of people from coastal areas in over half a dozen states. The purpose of the exercise is to increase tsunami preparedness, evaluate response capabilities in each state and improve coordination throughout the region. It is also aimed at enhancing tsunami preparedness at the community level. The exercise will simulate Indian Ocean countries being put in tsunami warning situation and require National Tsunami Warning Centre (NTWC) i.e. National and Local Disaster Management Offices (NDMO/LDMO) to implement and test their communication links and Standard Operating Procedures (SOPs) at all levels of warning chain. In this exercises, Hyderabad based Indian National Centre for Ocean Information Services (INCOIS) will be nodal participating agency. Kerala received heavy monsoon rainfall on the mid evening of August 8 resulting in dams filling to capacity; in the first 24 hours of rainfall the state received 310 mm (12 in) of rain. Almost all dams have been opened since the water level has risen close to overflow level due to heavy rainfall, flooding local low-lying areas. For the first time in the state’s history, 35 of its 42 dams have been opened. Most of the regions affected by this monsoon were classified as ecologically-sensitive zones (ESZs) by the the Western Ghats Ecology Expert Panel, the Gadgil Committee. Most of the recommendations and directions by the commitee was either neglected or rejected. Chairman of the committee Madhav Gadgil accused the state government and its irresponsible environmental policy for the recent landslides and floods. He called it a man-made calamity. National Disaster Response Fund is defined in Section 46 of the Disaster Management Act, 2005 (DM Act) as a fund managed by the Central Government for meeting the expenses for emergency response, relief and rehabilitation due to any threatening disaster situation or disaster. NDRF is constituted to supplement the funds of the State Disaster Response Funds (SDRF) of the states to facilitate immediate relief in case of calamities of a severe nature. The July 2015 guidelines states that natural calamities of cyclone, drought, earthquake, fire, flood, tsunami, hailstorm, landslide, avalanche, cloud burst, pest attack and cold wave and frost considered to be of severe nature by Government of India (GoI) and requiring expenditures by a state government in excess of the balances available in its own SDRF will qualify for immediate relief assistance from NDRF. In the event of a disaster of ‘a severe nature’, in which the funds needed for relief operations exceeded the balances in the SDRF account, additional assistance would be provided from the NDRF after following prescribed procedures. The financial assistance from SDRF/NDRF is for providing immediate relief and is not compensation for loss/damage to properties /crops. In other words, NDRF amount can be spent only towards meeting the expenses for emergency response, relief and rehabilitation. For projects exclusively for the purpose of mitigation, i.e, measures aimed at reducing the risk, impact or effect of a disaster or threatening disaster situation a separate fund called National Disaster Mitigation Fund has to be constituted. The primary purpose of NDRF is to supplement the SDRF, in case there is a calamity of “severe nature” which requires assistance over and above the funds available under SDRF. It recognizes that the State has the primary role to reduce disaster risk but that responsibility should be shared with other stakeholders including local government, the private sector and other stakeholders. SFDRR is an international Treaty that was approved by UN member states in March 2015 at the Third World Conference on Disaster Risk Reduction held in Sendai, Japan. It is a voluntary and non-binding treaty which recognizes that the UN member State has the primary role to reduce disaster risk. It has framework for 15-year i.e. 2015 to 2030. It calls for sharing the responsibility with other stakeholders including local government, the private sector and other stakeholders. 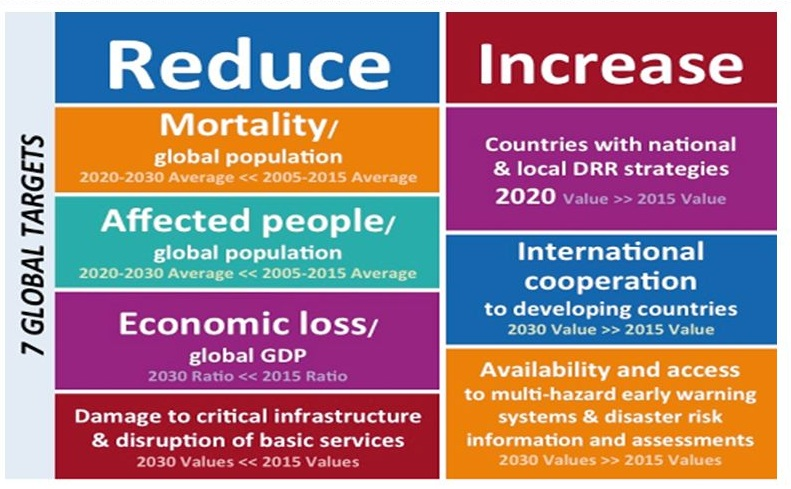 It is successor of the Hyogo Framework for Action (2005–2015), which had been the most encompassing international accord on disaster risk reduction. It sets common standards, a comprehensive framework with achievable targets, and a legally-based instrument for disaster risk reduction. It calls for adopting integrated and inclusive institutional measures for preventing vulnerability to disaster, increase preparedness for response and recovery and strengthen resilience. Enhancing disaster preparedness for effective response and recovery, reconstruction and rehabilitation. It works under National Disaster Management Authority (NDMA) which lays down policies, plans and guidelines for disaster management. At present there are 12 battalions in NDRF which are deployed strategically across country to provide immediate response. 4 new battalions are sanctioned by Union Cabinet. 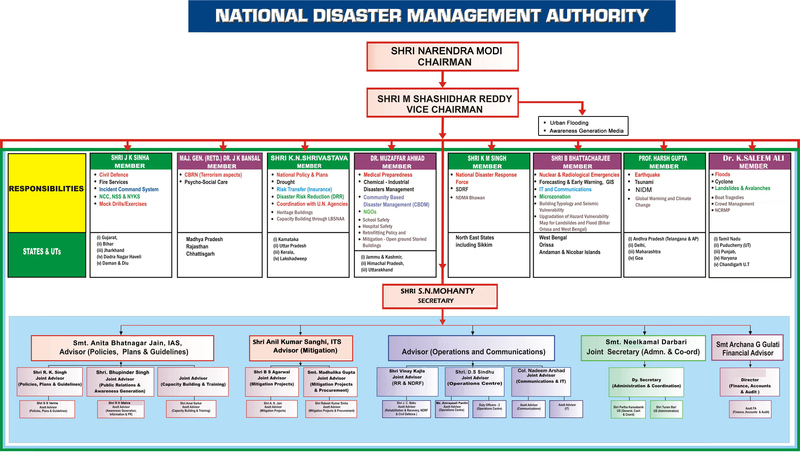 The Disaster Management Act, 2005 has made the statutory provisions for constitution of National Disaster Response Force (NDRF) for the purpose of specialized response to natural and man-made disasters. Two national calamities in quick succession in the form of Orissa Super Cyclone (1999) and Gujarat Earthquake (2001) brought about the realization of the need of having a specialist response mechanism at National Level to effectively respond to disasters. This realization led to the enactment of the DM Act on 26 Dec 2005. Proactive deployment during impending disaster situations. Acquire and continually upgrade its own training and skills. Liaison, Reconnaissance, Rehearsals and Mock Drills. Impart basic and operational level training to State Response Forces (Police, Civil Defence and Home Guards). Why it is said to be UNIQUE? 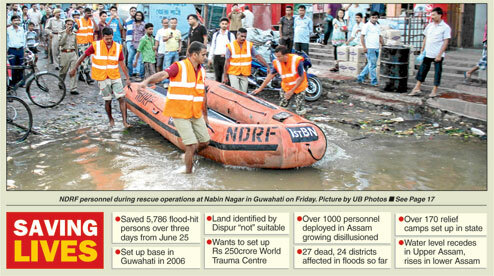 It is the only dedicated disaster response force of the world. The only agency with comprehensive response capabilities having multi-disciplinary and multi-skilled, high-tech, standalone nature. Experienced paramilitary personnel specially trained and equipped for disaster response.